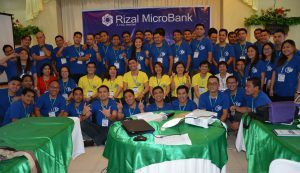 Rizal MicroBank’s President, Raymundo C. Roxas, giving his message and presenting the plans for the year. 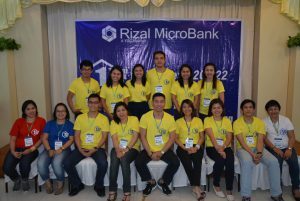 Rizal MicroBank held its first ever National Sales Conference and Training last February 6 to 10, 2017 at Cebu Northwinds Hotel, Salinas Drive, Cebu. This year’s conference theme, “One Team, One Bank, One RMB,” reflected the bold direction the bank is embracing to deliver its targets for 2017 and succeeding years. The five-day activity, which involved the Sales Conference/Rally and Product Familiarization and Credit Methodology Refresher Course, aimed to prepare, motivate and re-energize the Branch and Lending Operations Group in delivering the respective targets of the branches. 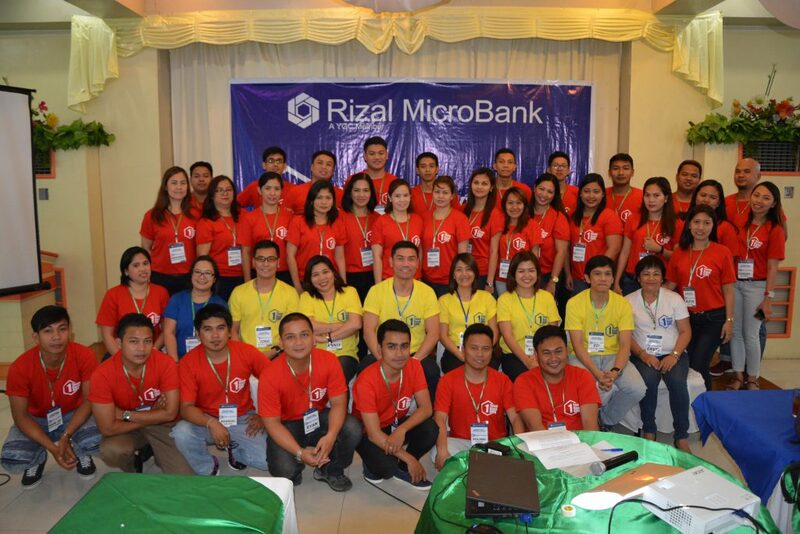 The bank-wide event was attended by all the branch heads and loan account specialists. Also present in the event were RMB’s Senior Officers namely, President Raymundo C. Roxas; First Vice President – Branch and Lending Operations Group Head, Emelita B. Rocero; First Vice President – Strategic Management Officer, Anatoly D. Gusto; Business Development Head, Eduardo T. Angeles, Accounting Department Head, Annie B. Alanano; Mindanao Area Operations Head, Libertine B. Cubio; Luzon Area Operations Head, Ma. Hazel F. Velasco; Visayas Area Operations Ervie E. Cane and Human Resource and Administration Officer, Ma. Beverly O. Uy. Outstanding branch and employees were recognized during the event. RMB Valencia, headed by Branch Manager Rollie Mamale, was awarded as 2016’s Best Performing Branch. 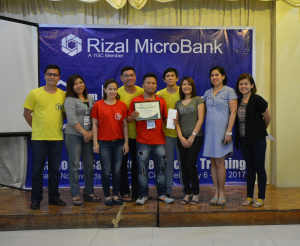 For the individual awards, Roland Latag of RMB Tanauan bagged the Best Performing Loan Account Specialist for Microfinance Loans while Fer Dianson of RMB Koronadal was the Best Performing Loan Account Specialist for Regular Loans. Participants were also given the chance to express their insights and learning. A number of participants shared that they were able to understand clearly the vision and mission of the company and were motivated to work harder for the bank and their families. 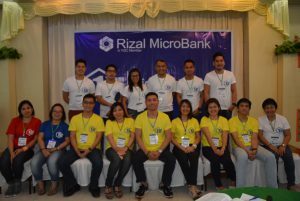 Others mentioned that the training refreshed their knowledge with the Basic Credit Methodology Course, as well as the loan products and packaging of Rizal MicroBank. 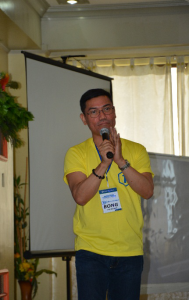 Some also shared that they learned best practices to lessen PAR and manage delinquent accounts. The proud and jolly Sales Team from RMB Mindanao Area with the RMB Management Team. The proud and jolly Sales Team from RMB Luzon Area with the RMB Management Team. The proud and jolly Sales Team from RMB Visayas Area with the RMB Management Team. The proud and jolly Sales Support Team from RMB Head Office with the RMB Management Team.